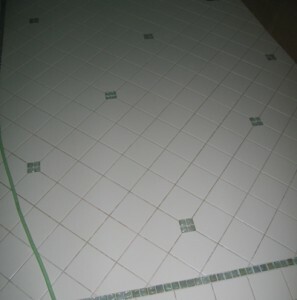 The tile prep is done and tile is being installed at a rapid rate! 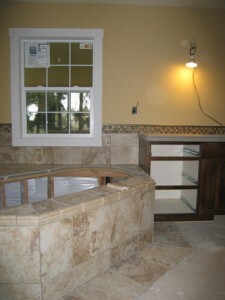 The master bathroom’s countertop, backsplash, shower floor, tub surround, tub deck and skirt, as well as the powder room’s floor, all have tile now. This bath is going to be gorgeous! 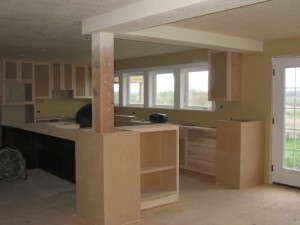 The kitchen and dining room cabinets have all been installed and the base cabinets have been templated for their granite countertops. 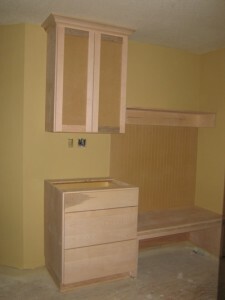 We are all pleased with how fast and smoothly the cabinets were installed. To keep the clutter out of the kitchen we designed some cabinetry for the back entry. This will act as a message center and a place to drop things off once you are in the house. The shelf above the bench will be a great place to place some baskets that can hold any items their kids and friends have left behind. The living room cabinets turned out even more beautiful than any of us expected. The fireplace is actually the existing family room fireplace that we found a new place for. 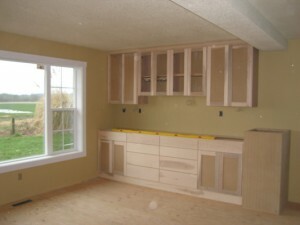 The cabinets will be painted and finished with a tile surround. Finally, the living room will have a focus point! 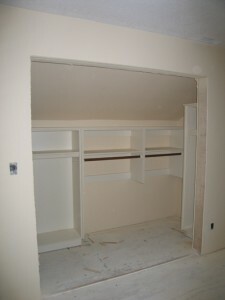 Here is a shot of their daughter’s closet. Because the closet is an abnormal shape we wanted to get as much storage out of it as possible. There will be room for clothing, shoes and even extra space for any hobbies she might have. 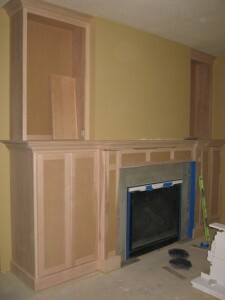 Interior trim and cabinet paint is what we will be looking at in the next post. If you have any questions about the project, or our process, so far please feel free to contact us at the office. The number is (541)752-0805.